A responsible approach to pre-pregnancy planning always contemplates the question how quickly can a woman get pregnant after giving birth, the answer to which is two-fold. A woman's ability to get pregnant typically returns within several weeks after childbirth as soon as she ovulates, unless she is breastfeeding, which temporarily delays the return of fertility. But just because she is able to conceive again does not mean it is safe for her and her future baby to do so. As such, a good comprehension of what optimal pregnancy spacing is can help couples make the best decisions for themselves and their families. Continue reading to learn everything you need to know about pregnancy spacing, including how long should you wait between pregnancies as well as what are the risks of getting pregnant too soon or waiting too long for another baby. Pregnancy spacing, also called birth spacing or interpregnancy interval (IPI), is defined as the number of months between giving birth and getting pregnant again. Numerous studies have analyzed the progression of pregnancies with various intervals in between them. They found that pregnancy spacing between matters a great deal as it dramatically affects the health of the baby and mother. The best pregnancy outcomes have been observed among women who waited between 18 to 24 months but not longer than 59 months before getting pregnant again. It included both natural births as well as Cesarean deliveries. 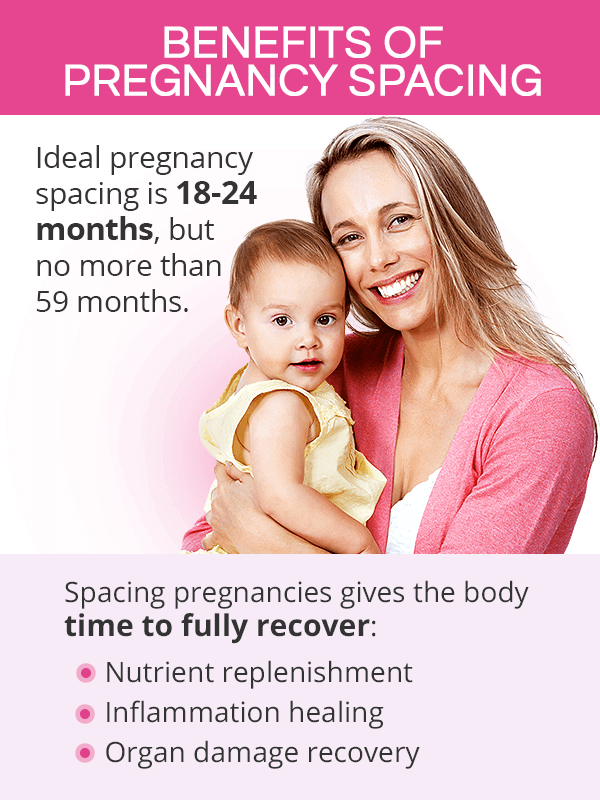 Recommendations for pregnancy spacing over 35 are generally shorter due to a natural fertility decline with age. Women past their mid-30s are typically advised to wait 12 months before getting pregnant with another child. Replenishing the nutrients. Pregnancy is known to be nutritionally draining for a woman's body, especially in terms of folate levels. The body needs time to rebuild its reserves, often as long as a year, in order to prevent pregnancy complications that have been associated with nutritional deficiencies, including spina bifida. Healing from inflammation. Infections and inflammations in various body parts are relatively common during and after birth as the body goes through various changes to return to its pre-pregnancy state. Conceiving too soon with ongoing inflammation or an infection may lead to various complications during pregnancy. Recovering from organ damage. Childbirth takes a toll on the genital tract, including the uterus and pelvic floor muscles. Getting pregnant before the organs and tissues have a chance to properly heal might not allow the body to support the demands of another pregnancy. It is estimated that one in every three women do not wait long enough before getting pregnant again, while others wait too long. Studies have shown that getting pregnant in the first 6 months since giving birth carries the highest risks of complications that may affect the health of the mother and the baby alike. 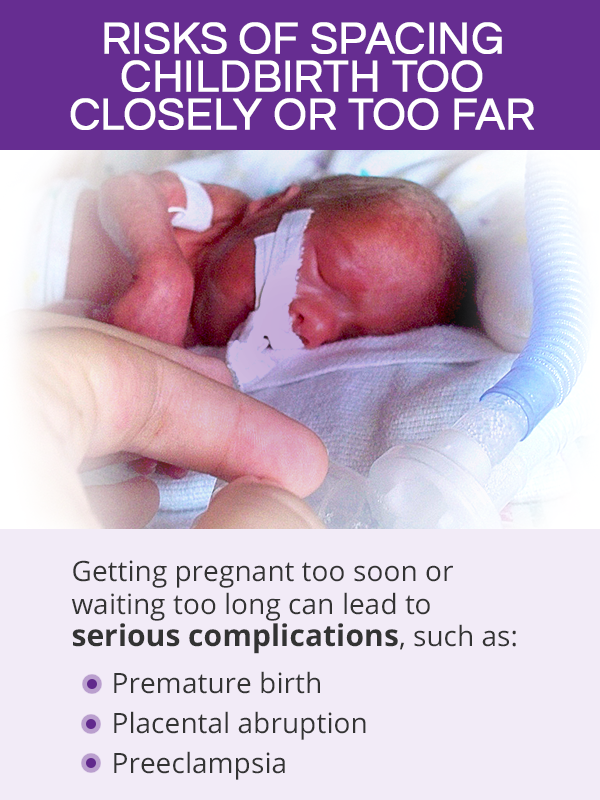 Conceptions taking place between the 6th and 17th month as well as after the 60th month since previous pregnancy also carry considerate risks of adverse outcomes, but to a slightly lesser extent than those occurring in the first six months. It is common for couples to want to minimize age gaps between subsequent children. However, the question of how soon after giving birth can you get pregnant again should be analyzed not only in terms of a woman's ability to conceive following childbirth, but - most importantly - in terms of the potentially serious health consequences of getting pregnant too fast or waiting too long. 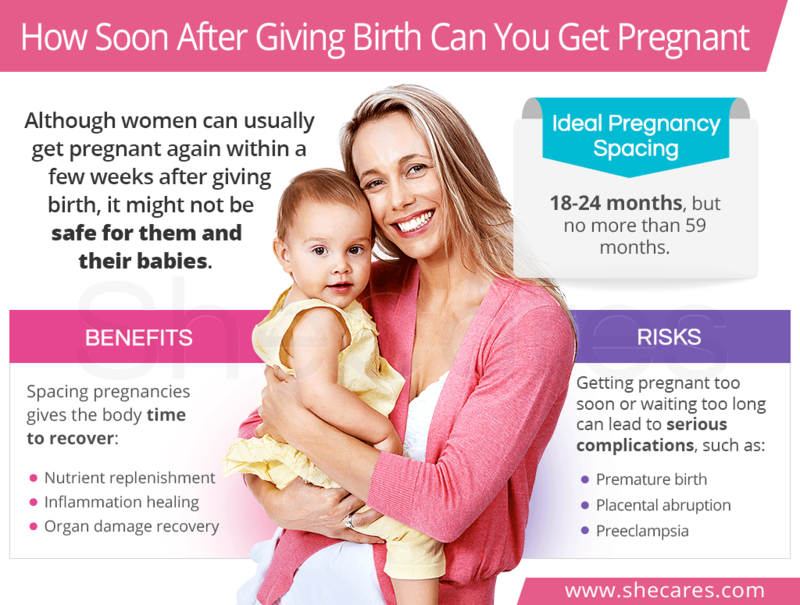 The current pregnancy spacing recommendation is to wait at least 18 months, but not more than 59 months, before getting pregnant again. The highest risk of pregnancy complications have been observed in conceptions that took place in the first 6 months since giving birth. Women who conceive between the 6th and 17th month and those who get pregnant 60 months after birth are also at a higher risk of complications, but slightly less than the other group. As such, knowledge of the benefits of ideal birth spacing is essential to optimal health of the mother and the baby alike.